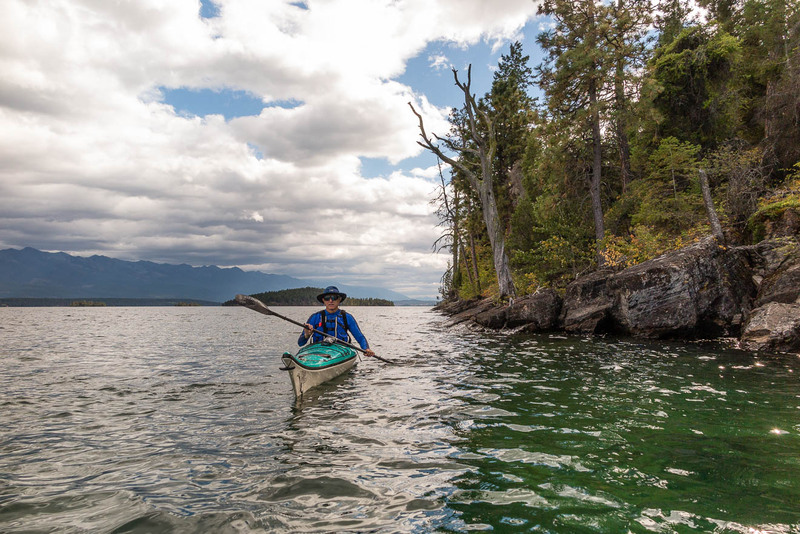 Over the past few years several people have asked, “Gary, will you take me paddling on Flathead Lake?” They have wanted to learn from my experience about where and how to paddle a sea kayak on the largest inland freshwater lake west of the Mississippi. I began this blog to make helpful information about paddling Flathead available to more people, to share some of my discoveries, and to inspire more people to take up sea kayaking for all the benefits, pleasures, and insights it provides. The blog also gives me a way to archive some of my favorite or most interesting paddles. By searching through current and past posts a reader will learn from my mistakes and discover routes and incidents along the way that seem particularly rewarding. Someone not inclined to paddle might enjoy these accounts as well. Observations made along 180 miles of shoreline and around island perimeters, accounts of encounters with a wild array of waves and weather, might be of interest to someone who enjoys the interface between land and water. As I write about my own experiences, I am keenly aware that we can learn only the barest essentials from other people. Our learning is deepest and most memorable when we learn from our own experience—when to venture out on the water and when not to; how many miles we can cover in a day; what most satisfies our deepest thirst for adventure or peace. All these things mean the most when we discover them for ourselves. At best I hope to point toward what will become your own discoveries, your capacities and limits, your perceptions that will be transformed within you into a treasured store of memories. In addition to describing the process of paddling possible routes and encounters along the way, this blog will occasionally address less visible things, what we might call the currents beneath the waves. A sea kayak moves slowly enough to offer a paddler time to think, time to see connections and relationships, time to gain perspective. It gives the paddler time to reflect and see what things signify. The inner world and discoveries we make on the complicated passages of the mind and heart belong to this blog as well. My name is Gary W. Hawk. I am a contemplative sea-kayaker who at age 56, after renting boats for short paddles in Sitka, Alaska, decided to take up his own paddle closer to home. I build furniture in a shop in Missoula, Montana and teach at the Davidson Honors College at the University of Montana. I am also engaged in a long process of increasing biodiversity on one acre of land on the south edge of town. It may be too much to say that I am a poet. It is more the case that poems happen to me and I do my best to write them down. I began this blog in part because someone asked me to write about my experiences on Flathead Lake as a way of helping other paddlers overcome their hesitations about being on such a vast and changeable body of water. I write to help people experience the lake’s generous heart, range of moods, and potential dangers. I also write about my paddles because I have come to love this lake, and therefore want to insure that its clean water, forests, and all the other creatures who depend on it remain available for as many generations as we can imagine. I am not an expert paddler; I am simply attentive to the process of propelling little more than a glass envelope through the waves. I delight in the mix of shadow and light, the colors of shallows and depths, and the sound of moving water. Dad, this is a great start. I am still reading the posts that you have made thus far but I think you are really off and running or maybe paddling is more appropriate. Give people your name! I’ll leave that up to you but I think it would be good to know who is writing. I think your writing is exquisite, reminiscent in a way of the book, “A River Runs Throught It,” not the movie, the book.